With a rise in work place injuries across many industry sectors, falls from height are still the most common cause of fatalities according to the HSE. Many of us know this is the case however, the figures are gradually rising year on year. It begs the question, are employers doing enough? Perhaps it’s not a case of ‘are they doing enough?’, rather, do they know enough about the subject and how to prevent or decrease the risk? 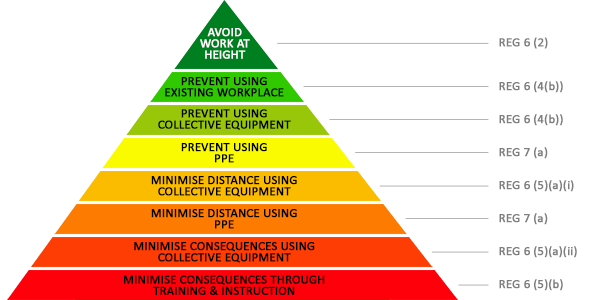 As a starting point, the severity of risk should be determined by using the below ‘Hierarchy of Control Measures: Work at Height’. Here at Heightsafe Systems, we’re able to attend site and assess the situation on your behalf, then offer our recommendations based on site specific findings. Our highly skilled operatives, based on their recommendations, can then carry out site specific designed installations, followed by compliance testing to ensure that you meet your legal responsibilities. One such industry is Window Cleaning. In January 2015, Heightsafe Systems solved an access issue for department store giant, Selfridges. Selfridges were opening a brand new customer services lounge on site, the location of which was in their Oxford Street store that has remained unchanged for many years. Window cleaning is probably something that isn’t at the forefront of people’s minds, yet it still carries an extremely high risk to the workers who carry out the job. It’s such a seasoned profession that these risks might not immediately spring to mind. YOU have a duty of care to ensure the risks are minimised. They are on YOUR site so make sure YOUR legal responsibilities are met. If you have any issues surrounding window cleaning, Heightsafe Systems can offer a number of solutions to help minimise the risk, and it’s a risk that will never go away unless we can all cope with dirty windows….. or afford self-cleaning glass, if technology ever produces this. Contact us today on 0845 604 6890 to find out more.